Toss away the crystal ball! Of course there is no rational way to ‘predict’ what will be important for HR leaders and business execs in 2019. In almost every case, each organisation is on a unique journey of people transformation, technical empowerment, culture mind-shift or simple operational improvements. So my list is a collection of stuff which I’ve happened to engaged HR and other leaders about in the last 12 months and which was being considered for future plans. Perhaps only 1 is of interest to you, maybe all 9 – It doesn’t really matter. HR Analytics has become an important tool for supporting organisational decision making around people. But it tends to support the employer more than the employee. As we see Employee Engagement, Happiness and changes in the Workforce and Workplace take center stage, there is a gaping hole around providing individuals with Personal Analytics in order for them to make better personal and business related decision within a continually fast-paced and constantly changing work environment. As we see new technologies such as Chat-bots, Robotic Process Automation, Machine learning Algorithms, Personal data-sharing and Tracking cozying up next to human workers, the trust relationship which underpins so many things in our organisations is being diluted. The need is not just about building trust in technologies which are performing ‘human-like’ tasks or gathering our data, but effectively managing the implications for functions such as HR who have custodianship over some of these new-age tools. Executive coaching is a mature offering, but as the nature of work and the variety of relationships between an organisation and a worker develop ( I don’t want to say employee, because many are not technically that), the need for Independent Development Coaches at lower levels, and which is not funded by the employer is being sought. Some of this demand exists because younger talented individuals do not want to mirror the behavior of current leaders (Think about many current Bank Leaders…. not a good model to follow), but want to become the best version of themselves without company influence. I’ve never been a fan of culture or engagement surveys – statistically they are full of errors and often based on pop-psychology. However listening with ‘Data Ears’ is becoming more relevant. In other words understand the mood of the company, or Engagement levels (Customer or Employee) or Happiness levels by analyzing the data trail left by employees, customers, your supply chain seems far more reliable and less prone to typical survey inaccuracies. One of my favorites. I’ve been engaging on this topic for a number of years. But with the changing workforce landscape, the growing contingent and gig enthronements, workers want the ability to store their own work history (think mini HR system), including Learning records, Pay and Benefit data, Performance scores, basic biographics, Job and Position history. They want control over their own data, and the ability to share it and withdraw it easily with an employer. This is not your typical Linkedin profile BTW. Big opportunity for HR Software vendors. Not necessarily new, but becoming an area of focus again as organisations get lost if their digital and technology transformation activities. Humans are irrational, make mistakes and are not perfect. Technology, with all its benefits, has the ability to create sterile and perfect environments, which are not conducive to human productivity or happiness. Making sure we don’t capitulate our responsibility to communicate to machines/technology is important. HR is actually a lot more complex that most people realize. Often the individual HR activities are not complex (some can be though), but ensuring there is alignment across a multitude of interrelated HR activities is where the real complexity lies, and where things often go wrong. Underpinning all HR decisions is the level of HR Maturity. When HR activities are not executed based on the Maturity level, you typically get Executive despondency towards HR or frustrated HR leadership. The fast-paced and continuously changing work environments are demanding HR and IT leaders make quick, but informed HR Technology buying decisions. Gone of the days that it takes 4-8 months to do a traditional RFP, only to discover the new SaaS tools you were considering have significantly changed. There are some great services, analysts and tools available to speed up these decisions. Many organisations are realizing the traditional Dave Ulrich HR operating model needs some adaptation. Not a radical change (as it is mostly still working), but a focus change to ensure the operating model can support ‘speed and agility’ needs of modern organisations. Changes include the ‘Business Partner’ reaching into the customer and supply chain world, the ‘Centre of Excellence’ (CoE) becoming a Networking Management Function and the ‘Shared Service Centre’ transforming into a Digital Data Centre. There is no denying that all of us are on a digital transformation journey. Our work environments and operating models are feeling the strain of being caught between more traditional business operating models and the newer, agile demands of techno-digital environments. Deciding whether to toss out the old approach or focus on a more evolutionary adaptation of your existing ways can be a daunting decision to make for HR leaders. The Ulrich model of HR delivery, developed by Professor David Ulrich 20 years ago, has been a solid guiding framework in full or part for most HR functions globally. And even though the model has been contested over the years, the building blocks of the model; HR Shared Service Centres (SSC) for administration, Centres of Excellence (CoE’s) for content expertise and the HR Business Partner (HRBP) for business alignment, have worked – so why change something that ‘ain’t broke’? The underlying design principle of the Ulrich model has been about effective and streamlined connectivity between the elements of HR and business operations and strategy. It was built on assumptions that were pre-digital age. But the digital work environment has introduced new technologies such as Robotic Process Automation, Cognitive computing, Artificial Intelligence (AI), new thinking styles such as Design Thinking, Evidence-based decisions supported by deep-dive Data Analytics as well as a deluge of demographic, ethics and loyalty impacts. As HR professionals, the worse thing we can do is bury our heads in the sand and fall prey to the Normalcy Bias, believing things will always function the way things normally function. We need to consider how a digital environment is changing the way the workforce is empowered, interacts and connects. In a Digital world, HR must respond and adapt quickly to changes which impact your business, whether that be through external competitiveness or internal innovation. This will require the roles of the HRBP, SSC and CoE to transform into ‘early warning’ detectors and predictors which can seamlessly morph into problem-solving guru’s and inform the creation of relevant and unique HR solutions. How should these roles change? Modern HR technology, digital and automation tools fully empower line managers to be effective in hiring, managing and developing their staff. It’s time to get beyond playing the quasi-admin role for line managers. The Alignment Agent is externally focussed around your organisation’s supply chain and customers, ensuring HR solutions are adding customer-focussed value in line with business strategies and advising line managers and executives on required changes. The new Alignment Agent is seeking out business issues from a people perspective and doing problem-solving with data analytics. As Automation and Robotic Processing takes over administrative tasks and AI replaces more complex HR admin tasks, the admin centre becomes obsolete but is reborn as an Analytics Engine Room that supports business problem solving and provides predictive capability to business leaders. Their outcomes inform future HR solutions. The future SSC employee is a data scientist or analyst. The engine room is not HR centric only, but can be part of a broader analytics entity or could be an outsourced service. The new CoE will still require deep-skilled and experienced HR practitioners who will remain the thought leaders for appropriate people practices. They will be responsible for developing and deploying solutions which are identified by the new Alignment Agent and use data-driven outcomes from the Analytics Engine Room to validate their solutions. Solutions are not always standardised and can be focussed on providing the best solution for a part of the business. The Ulrich model as a framework is still a relevant HR operating model, but the transition from the old roles to the new ones is an important adjustment required to support digital work environments. It requires forward thinking executives and HR leaders to recognize the different demands of a future workforce and workplace, and an acknowledgement that technology, applied in the right way, is empowering employees and workplaces to be super-agile, and achieve significantly more. HR must change. Posted in digital, Future HR, HR Strategy, HR Technology, HRIS and tagged Ai, digital, HR, HR Strategy, Robotics, Ulrich on 9 October, 2017 by Rob Scott. News out today (23 Feb) that Saba Software will acquire Halogen Software for $293 million. 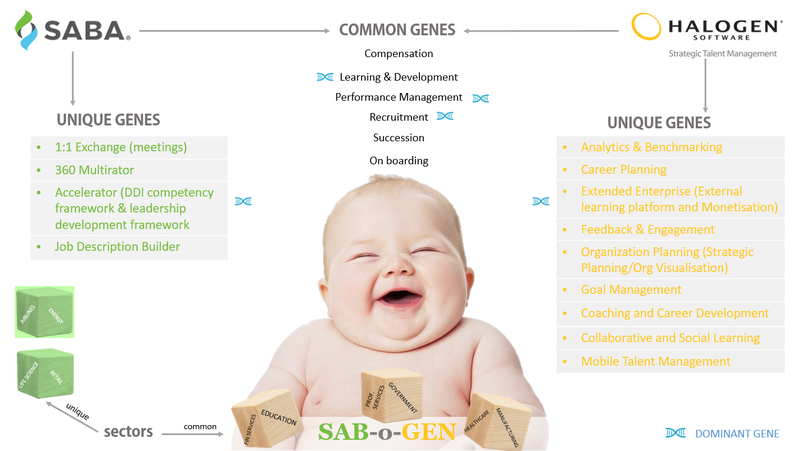 So what will the new “SAB-o-GEN” baby look like? What are the Common genes, the Unique genes, and who has the Dominant ones. If you are a current client should you be prepared for ‘baby sitting’ while the infant grows up? Time will tell. Posted in HR Technology, HRIS and tagged Halogen, HR Technology, HRIS, SABA on 27 February, 2017 by Rob Scott. A few years ago, HR functions would have been acknowledged as the custodian and owners of performance management together with the supporting technology. And if you went searching for a new performance management solution, you would struggle to find anything outside the HR technology vendor community. But many would argue that traditional performance management has been less than successful in improving employee performance and business value over the last 50 years, and at most it was an annual or bi-annual exercise in HR process compliance by line managers and their subordinates. This naturally gave rise to alternate performance management solutions outside the HR framework. Another trigger for change has been the move to the digital era. Modern technology has allowed the workforce to be increasingly mobile to the extent that jobs and location can be decoupled. The structure and nature of the workplace and workforce are radically transforming while the definition of an employee is largely irrelevant as more and more forms of “peripheral” work engagements are used. Contingent workers, “giggers”, freelancers, autonomous self-directed teams, agency workers, and outsourced/insourced teams are now part of the workforce fabric. Generally the HR function hasn’t included these peripheral workers on their performance management radar, mainly because they are not permanent employees, are not linked to career or succession plans, are often not hired onto the core HR system, the performance process doesn’t cater for short-term activity or teams, or HR has no control or authority over their appointment. Most HR technology vendors have focussed their recent performance management software updates around the shift from rigid annual reviews of goals and objectives to tools that facilitate ongoing communication, coaching and mentoring of permanent employees. What they haven’t done is deal with effective measurement of and feedback to peripheral workers. But away from HR’s eye’s other software systems, typically owned by operations, finance, marketing or procurement, tools such as Workforce Management (WFM), Contingent Workforce Management (CWM), accounts payable, freelance platforms, industry talent pools, social engagement platforms, social media platforms and others are actively geared to track performance against goals, assess quality, track activity through Internet of Things connectivity, provide team, company or individual feedback, and inform “re-hire” decisions. Over the next five years, the size of the peripheral workforce will continue its upward trajectory. Analysts generally expect this number to be as high as 40 per cent of the total workforce by 2020. Even today, most new jobs created in Australia are part-time. Irrespective of the employment type, managers still need to focus and align their workforce to achieve their organisational and business specific objectives in the most efficient way. Performance management can no longer be done in a standardised way, rather it must cater for the specific type of engagement relationship. Some employees will still require traditional cascading-goal performance management, others may need social goal-setting and peer review, while others simply need a star rating and re-hire indicator. Performance management now has co-ownership. The opportunity is ripe for HR to broaden its performance management definition and join forces with other performance management system owners within their organisations to establish a complete workforce performance framework. Continuity, engagement, feedback, opportunity and development are the collective cornerstone of an employer value proposition – it will be hard to achieve or maintain this if close to half the workforce is not included in a performance framework. HR departments are no longer the sole custodians of performance management solutions. The shift towards the digital economy has given rise to a new type of workforce which is not bound by time, location or permanency. Their performance management needs are significantly different to permanent full-time employees. Modern operations management, procurement, financial and marketing software solutions cater for relevant forms of performance management and feedback. Organisations need a workforce performance framework which is underpinned by choice and appropriateness rather than a single standardised approach to management of performance. As the contingent labour force increases as a percentage of total workforce, greater urgency is needed to build strong relationships with these teams and individuals through new performance management approaches and tools. Posted in Future HR, HR Strategy, HR Technology, HRIS and tagged Future, HRTech, Performance Management on 24 February, 2017 by Rob Scott. You’ll be forgiven for thinking Chatbots are new technology, they’ve been around since the 1960’s in fact, but have been given a new lease of life with the recent developments in machine learning and artificial intelligence. The word itself gives some hints as to what it does. “Chat” implies a form of informal communication and “bot” indicates the presence of robotics. In reality they are small software applications that automate tasks on your behalf over the internet and interact with you in a human-like way. Many of these tasks tend to be basic, repetitive and gimmicky , however we are seeing the emergence of sophisticated business chatbots that learn and adjust their behaviour and response. The way you interact with these bots is casual and in natural language. Most of the major tech houses like Facebook, Google, Microsoft and Apple are actively developing these bots, and you’ve probably used some of them such as Siri (iPhone), or Cortana (Microsoft), Alexa (Amazon Echo) and a host of text based chatbots now found in tools like Skype and Slack. (On a side note let’s hope soon-to-be parents don’t start naming their babies with similar names – can you imagine the chaos in the home and future workplaces). RAMCO the Indian based Enterprise Software Vendor is providing their HR clients with e-mail communication to its HR system, citing speed as a primary motivator. They have a number of other tools in their other non-HR modules of similar ilk. Other vendors like ADP are building bots that automate HR tasks such as sending a job to a prospective hire and alerting employees to use up their annual leave. The other likelihood is that Chatbots will be developed outside of the vendor products. There are a number of specialist platforms such as Kore who provide tools for bot self-development and others who provide existing libraries to commonly used systems. Chatbots are unlikely to replace the need for slick end-user interfaces in the short term, but they are potential big cost savers from a vendor development perspective as well as for software licencing. As chatbots become more proficient and operate like real assistants or concierge services, people will want to use them, creating a demand. Hopefully vendors and developers have their ears to the ground. This seems somewhat of an odd statement to make in todays technology obsessed world – surely HR technology has allowed People practitioners to greatly improve efficiency by reducing manual and paper-based activities, improving data access & reporting, reducing errors, helping employees make better decisions and ensuring compliance to policy and procedure. This is of course true at a transaction level, but herein lies the problem. The way vendors have generally designed HR technology is not an accurate reflection of how professional HR and Talent managers think, nor does it signal an understanding of the complexities in Professional HR Management. In fact the slicing-up of HR into different software modules along ‘logic’ and ‘transaction’ lines of thinking has created and perpetuates the view that HR is simply a set of somewhat loosely interrelated basic transactions. And surely that can’t be too difficult to get right! ah, yeah! But yet time and time again we see HR functions under attack for poor performance and low value contribution. With these perceptions abound, no wonder there is doubt among some C-levels that HR is needed. If only HR Management was so simple and logical. But it isn’t. There are a significant amount of people dimensions used by HR professionals which are not logically inclined or lend themselves to be developed into a ‘transaction’, let alone a software module. Think about important people management facets such as ‘Ethics’ , ‘Style’, ‘Diversity’ and ‘Values’ – these are key HR influences in achieving particular strategic business outcomes, and they are fundamentally intertwined into such things as learning, performance, development, communication and knowledge sharing. But they are ‘non-existing pieces’ in the HR software puzzle. This is not a jibe at HR Software vendors. In fact some vendors clearly understand the impact of these gaps and are working hard to address them. Particularly those vendors who are focused on superior technical integration between modules. They realize that while they have in many cases reduced HR to modular transactions to make it easy for end users, they also understand that the all-important ‘HR complexity value factor’ is partly resolved when effective and seamless integration across these modules occurs. The combination of modular interaction offers some support in achieving strategic HR objectives. Keep going vendors, there is lots more to do in this space! HR Technology has inadvertently contributed to a weakening of professional HR outputs, but the finger should however point directly at the HR leader who has allowed the function to be reduced to a set of modules and transactions. It’s an easy way out for poor performing HR leaders, and provides an opportunity to shift the blame onto technology. Professional HR management is not an easy job, in fact it is highly complex, with over 40 major elements or activities being continuously juggled to produce desired business outputs. Those that are successful also understand how HR technology should be used and positioned to enable people to achieve great things. Do you have an opinion on this?